If this card is Normal or Special Summoned: You can add 1 "Infinitrack" monster from your Deck to your hand, except "Infinitrack Harvester". You can target 1 other Machine monster you control; the Lev.. If this card is Normal or Special Summoned: You can Special Summon 1 EARTH Machine monster from your hand in Defense Position, except "Infinitrack Anchor Drill". You can target 1 other Machine monster..
You can Tribute 1 EARTH Machine monster; Special Summon this card from your hand in Defense Position. You can banish 1 Machine monster from your GY; add 1 "Outrigger Extension" from your Deck to your ..
You can Tribute 1 EARTH Machine monster; Special Summon this card from your hand in Defense Position. You can banish 1 Machine monster from your GY; add 1 "Spin Turn" from your Deck to your hand. You ..
You can Tribute 1 EARTH Machine monster; Special Summon this card from your hand in Defense Position. You can banish this card from your GY, then target 1 Level 5 or lower "Infinitrack" monster in you..
You can Tribute 1 EARTH Machine monster; Special Summon this card from your hand in Defense Position. You can banish this card from your GY, then target 5 EARTH Machine monsters in your GY; shuffle th..
2 Level 5 monsters. When this card destroys an opponent's monster by battle: You can attach that monster to this card as material. You can only use each of the following effects of "Infinitrack River ..
2 Level 7 monsters. When this card destroys an opponent's monster by battle: You can attach that monster to this card as material. You can only use each of the following effects of "Infinitrack Mounta..
2 Level 9 monsters. When this card destroys an opponent's monster by battle: You can attach that monster to this card as material. You can only use each of the following effects of "Infinitrack Earth ..
1 non-Link "Infinitrack" monster. If this card is sent from the field to the GY: You can target 1 Xyz Monster you control; attach this card to that monster as material. You can only use this effect of..
3 Xyz Monsters. Unaffected by other monsters' effects, except those of Xyz Monsters. Cannot be destroyed by battle, except with an Xyz Monster. You can target 1 Xyz Monster in your GY and 1 card your .. Your opponent cannot target Machine Xyz Monsters you control with card effects. Once per turn: You can target 1 "Infinitrack" Xyz Monster you control; Special Summon from your Extra Deck, 1 Machine mo..
Activate 1 of the following effects. 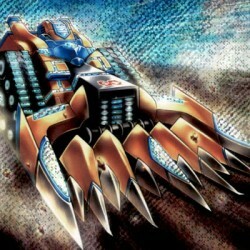 :- Target 1 EARTH Machine Xyz Monster you control in Attack Position and 1 monster your opponent controls; change the battle position of your monster, and if you d..
During the Main Phase (Quick Effect): You can Tribute this card, then discard 1 Spell; Special Summon 1 "Witchcrafter" monster from your Deck, except "Witchcrafter Potterie". If you have no cards in y..
During the Main Phase (Quick Effect): You can Tribute this card, then discard 1 Spell; Special Summon 1 "Witchcrafter" monster from your Deck, except "Witchcrafter Pittore". You can banish this card f..
During the Main Phase (Quick Effect): You can Tribute this card, then discard 1 Spell; Special Summon 1 "Witchcrafter" monster from your Deck, except "Witchcrafter Schmietta". You can banish this card..
(Quick Effect): You can discard 1 Spell; Special Summon 1 "Witchcrafter" monster from your hand, except "Witchcrafter Edel". You can Tribute this card, then target 1 Spellcaster monster in your GY, ex.. Your opponent cannot target other Spellcaster monsters you control with card effects. (Quick Effect): You can discard 1 Spell, then target 1 face-up card your opponent controls; destroy it. You can on..
During damage calculation, if your Spellcaster monster battles an opponent's monster (Quick Effect): You can reveal any number of Spells with different names in your hand, and if you do, your battling..
Add 1 "Witchcrafter" monster from your Deck to your hand. During your End Phase, if you control a "Witchcrafter" monster, while this card is in your GY: You can add this card to your hand. You can onl..
Target 1 "Witchcrafter" monster in your GY; Special Summon it. During your End Phase, if you control a "Witchcrafter" monster, while this card is in your GY: You can add this card to your hand. You ca..
Target 1 "Witchcrafter" monster you control; it can make a second attack during each Battle Phase this turn, also, if it attacks this turn, your opponent cannot activate Spell/Trap Cards until the end..
Target Spells/Traps your opponent controls, up to the number of "Witchcrafter" monsters you control; return those targeted cards to the hand. During your End Phase, if you control a "Witchcrafter" mon.. The first time each "Witchcrafter" monster you control would be destroyed each turn, by battle or card effect, it is not destroyed. You can only use 1 of the following effects of "Witchcrafter Bystree..
Once per turn, when your Spellcaster monster destroys a monster by battle: You can draw 1 card. You can only use 1 of the following effects of "Witchcrafter Scroll" per turn, and only once that turn. .. If you control a "Witchcrafter" monster: Target 1 Spell in either GY; add 1 card with the same name from your Deck to your hand. During either player's turn, except the turn this card was sent to the .. When this card is Normal Summoned: You can add 1 "Evil Eye" card from your Deck to your hand, except "Serziel, Watcher of the Evil Eye". If this card is equipped with "Evil Eye of Selene" (Quick Effec.. When this card is Normal Summoned: You can target 1 "Evil Eye" card in your GY, except "Medusa, Watcher of the Evil Eye"; add it to your hand. If this card is equipped with "Evil Eye of Selene" (Quick..